Hello hello and Happy New Year and a retroactive Happy Holidays to boot! I hope everyone had as pleasant and active a December as I did. I have been riding to work and back as always, and had ANOTHER bike stolen off my porch (the CUBE I had written of a while ago)! Although nobody deserves to have their stuff taken, this time I did forget to lock up my bike due to some kooky distracting and routine-altering events on that fateful day and the bike disappeared overnight. Relating those events would be quite boring for you for sure, so I won't bother. Having 2 bikes taken off one's porch might suggest to a normal person that keeping the bike on the porch is simply a bad idea. I am not normal, however. I am fortunate enough to have a nice front porch that makes outdoor storage of my bikes easy and convenient to my daily comings and goings. I stubbornly refuse to give that up; I mean, why should I? Because some lowlife bike thieving scum says so? No way. I am currently just being super careful to remember to lock up; Winter isn't exactly bike-thieving prime time anyway. Before Spring, however, I am gonna have to come up with some very strong security measures. If I lose another bike off that porch I am just stupid. Frankly, I just don't get it. I live in a nice neighbourhood. Are local bike thieves checking my lockup Every F-ing Night? Seems like it sometimes. You can see the saddle and handlebars from the street, so maybe every late night rambler who sees it takes a crack. There is a lot of pedestrian traffic around my house. Normally we consider that a nice thing. I'm currently riding Mutant Winter IV , although it no longer features the weird fender because I had handed the bike down to my son, who does not ride in winter and didn't require mutant customization. Now that I have commandeered it for my own selfish needs I'll have to dig up or buy some fenders again I guess, and figure out a new/different bike for my son! We in London Ontario have enjoyed the extended Fall weather that most others in North America experienced. The first truly Cold day was yesterday. 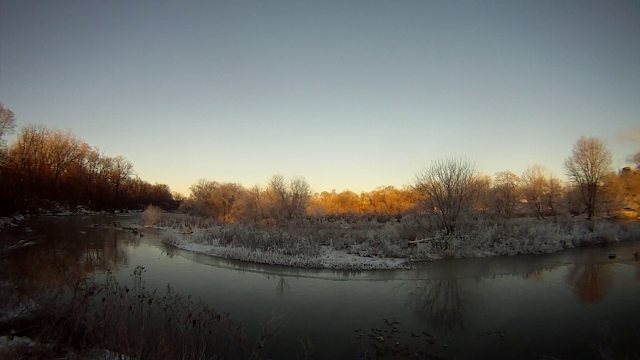 It was -17 C (1.4 F) on my morning ride. We have had very little snow so far, so riding the paths by the river is still possible. In terms of commuting, the New Year has been wonderful... cold can be very pretty. 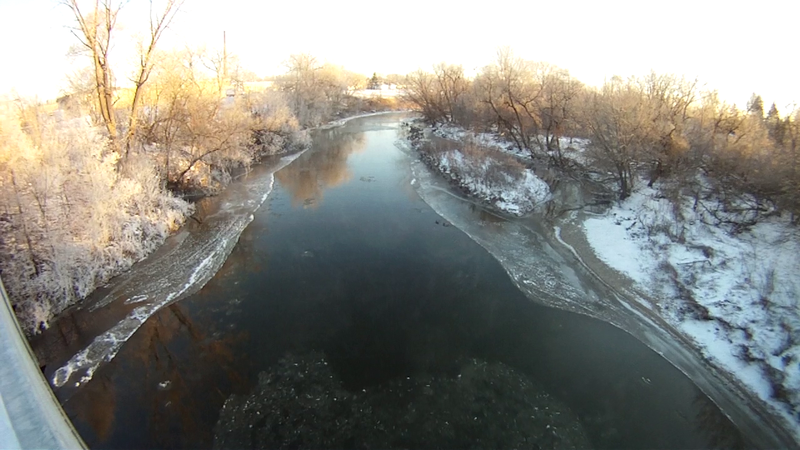 These pics grabbed from my helmet cam video don't come close to showing how beautiful the river really looked yesterday (and this morning for that matter). Just one more reason that commuting by bike is awesome. If no one was ever arrested for the thefts, your house has probably become a regular checkpoint among thieving scum who may be working your neighborhood. Why rip off in a crappy neighborhood? Go where people have better stuff and are more likely to think people are basically good. People who steal will do so until they're locked up or until some rare epiphany turns them to a different course. Thievery is like an illness that strikes a neighborhood and persists until the infectious agent is gone. Like lights, your locks can never be too many, or too strong. Stay locked up, my friend. A bicycle registry program that will allow you to log the serial number of your bike with us"
Maybe you still have your old serial number somewhere? I know I have mine saved at bikeindex.org.